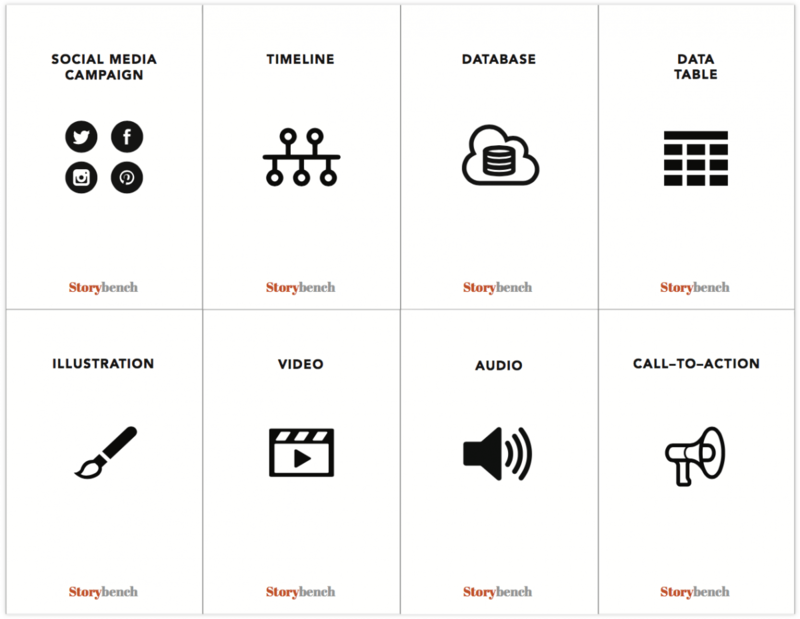 This story originally appeared on Storybench: Tools, Tips and Takeaways on Digital Storytelling From Northeastern University’s School of Journalism. At the Journalism Interactive conference hosted by the University of Maryland in October 2017, I presented a card game that I have been prototyping for the last year in classrooms from Northeastern University to the Nieman Foundation. 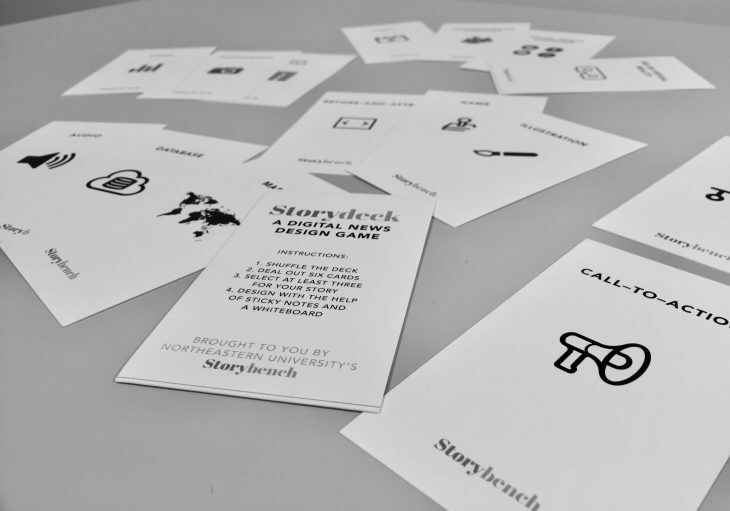 “Storydeck: A Digital News Design Game,” in a nutshell, helps students conceptualize, scaffold and focus a digital story for a specific topic and a specific user. Before starting the game, students should have fully-formed, focused story pitches and assemble in groups of four to five. 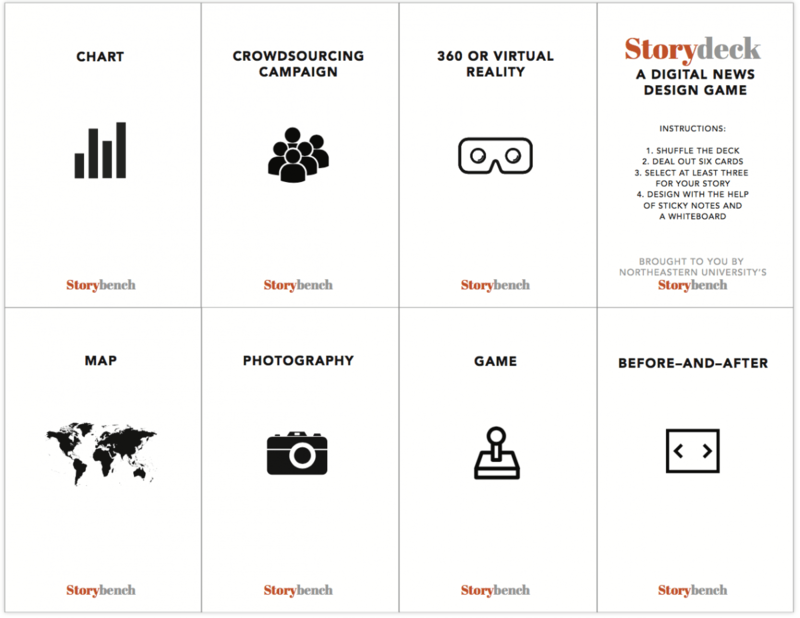 Each card in the deck of 15 contains a digital storytelling element – a map, photography, a game, a before-and-after, a crowdsourcing campaign, 360 or virtual reality, a timeline, a database, a social media campaign, a data table, an illustration, a call-to-action, a chart, audio or video. 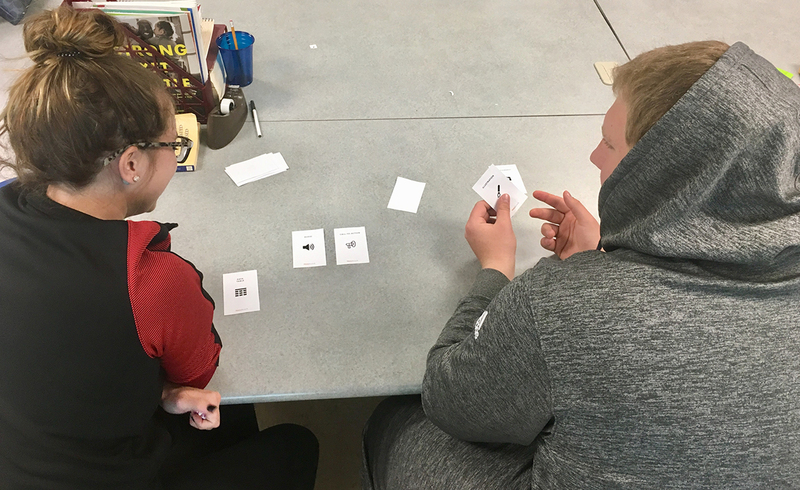 After deciding on one teammate’s story pitch, students deal the cards out and choose no more than three elements that might work for the story they’ve decided to pursue. With the help of markers, sticky notes and whiteboards, the students wireframe the story using the three elements, while considering at least one archetypal user experience, the constraints inherent in digital design, and, of course, deadlines and both technical and reporting feasibility. Extra points for multiple wireframes and detailed annotations. Ideally, the teams report, build and publish this story as a final class project. Have an idea for improving the game? Contact @storybench.